The custom Odyssey beer tap putter covers for the 2019 Waste Management Phoenix Open. The Waste Management Phoenix Open has long been known as the biggest party in golf. This year, Odyssey Golf is leaning all the way in on the celebration with custom beer tap putter covers for the event. The ever-present beer drinking by Phoenix Open fans is what Odyssey is playing off of with its custom putter protectors. The two covers are decked out in the tournament colors of green and yellow, and both (one for mallets, one for blades) are shaped like the handle on a beer tap. https://twitter.com/odysseygolf/status/1089910451218014209 The symbolism is simple. The tournament, which starts on Thursday, is hosted right near multiple big American universities, including Arizona State. Sun Devils students and other locals show up in force every year, earning it the title of best-attended golf tournament and transforming it into a week-long kegger. No place is that more true than the par-3 16th hole with its stadium seating and general debauchery. The Odyssey covers are highlighted with phrases like "Please Putt Responsibly" and "Pour It In! ", but the best feature has to be the bottle opener tucked into a little pouch on one side of the leather. The custom putter covers from Odyssey feature a removable bottle opener. 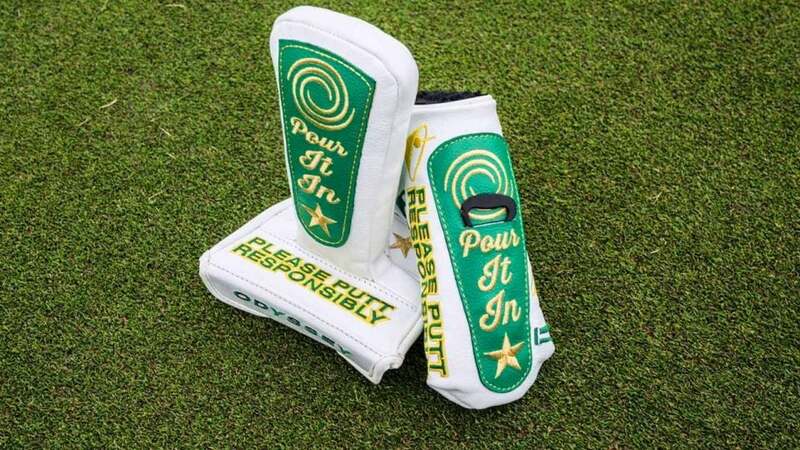 We'll no doubt see a bunch of these covers on the putters of Odyssey staff members on Tour when the Waste Management Phoenix Open kicks off Thursday. What we won't see, unfortunately, is Tiger Woods, who will skip the tournament in favor of resting up for his next appearance at the Genesis Open at Riviera in two weeks. Woods famously made an epic hole-in-one on the 16th at TPC Scottsdale when he played the event in 1997, just months before his first Masters win. Woods, who finished T20 in his first start of the year last week, recently recalled "smelling and hearing the beer hit behind me... to turn around and see all the beer flying was crazy." While you probably have to be an Odyssey staff player on Tour to receive one of custom covers, you can still get yourself one of the company's new Stroke Lab and EXO with Stroke Lab putters, which you can read all about here.